It’s the Information Age (you may have noticed). If you, or someone you care about, is feeling a bit left out, you could do worse than to connect up with the three-hour Computer Skills and Literacy course from our Professional Development series — the latest arrival on our iTunes U channel. Rather than a guide to finding the power button and basic trouble-shooting (is it plugged in? ), PRDV001 will go over the anatomy of a computer (in a brilliant video made by an teenager, mind you), important terminology, the Internet and World Wide Web (not the same thing! ), and general security issues. Three hours and an iOS device are all it takes. This course joins four of its professional development siblings on iTunes U — and we’ve got more on the way if you’d like to complete the set. Not on iOS? 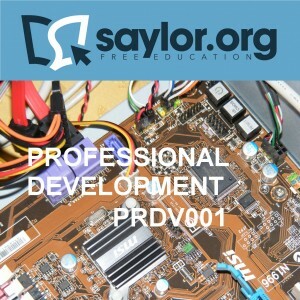 You can always find PRDV001 over at its other home on Saylor.org, too. We’ve got 38 additional courses to enjoy on iOS (including three more professional development courses), and all of those plus 242 more to enjoy at Saylor.org via your favorite browser.